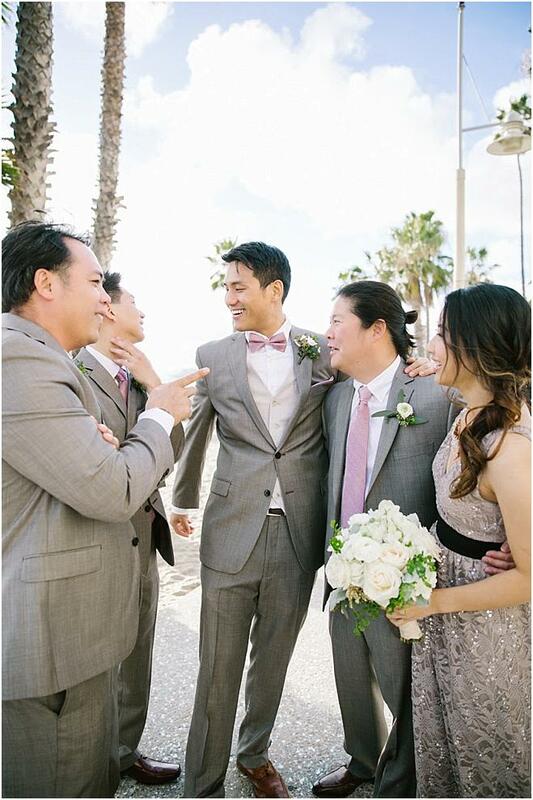 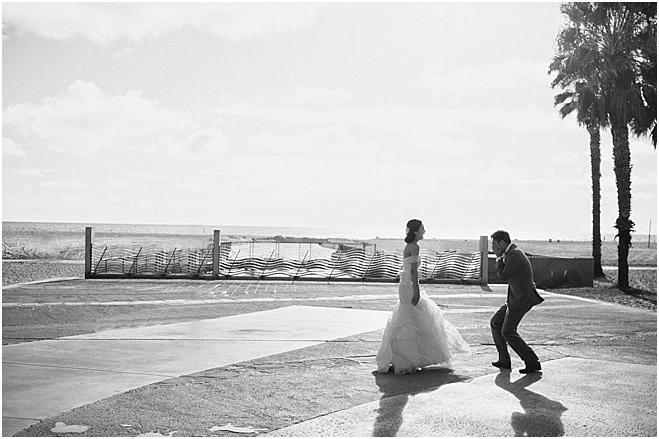 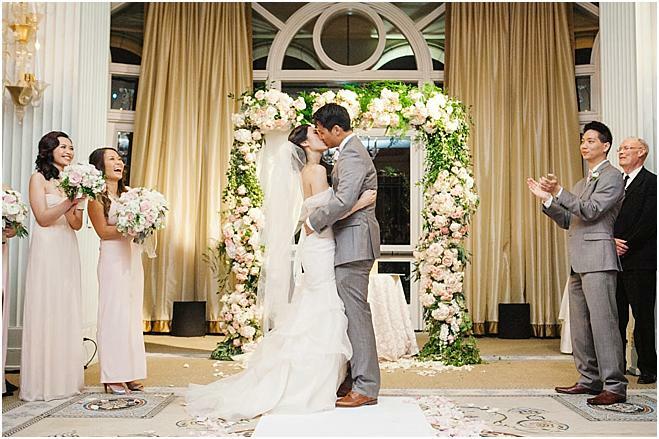 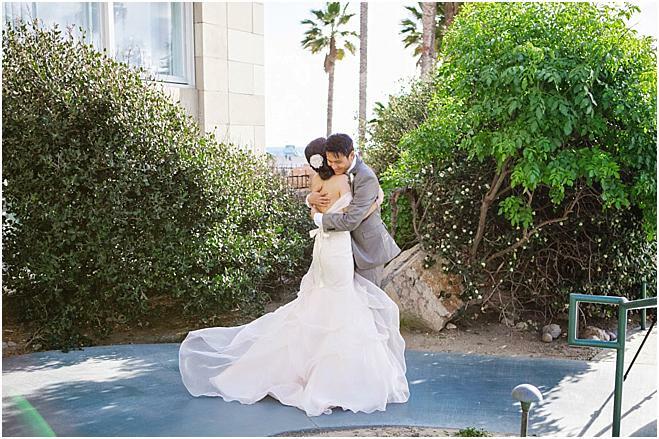 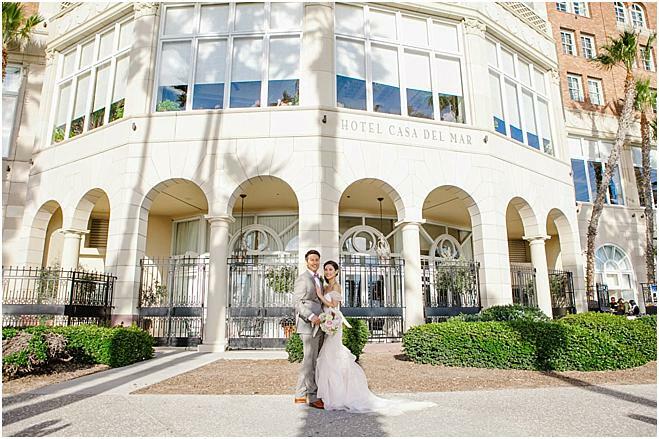 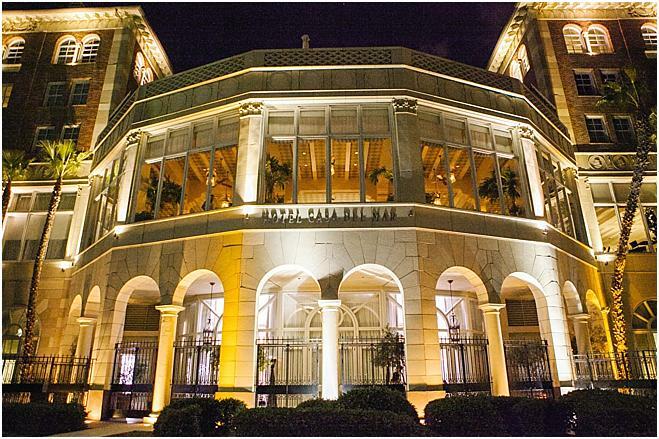 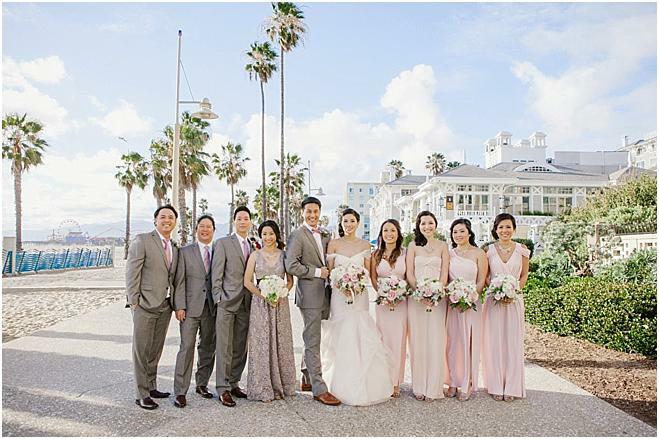 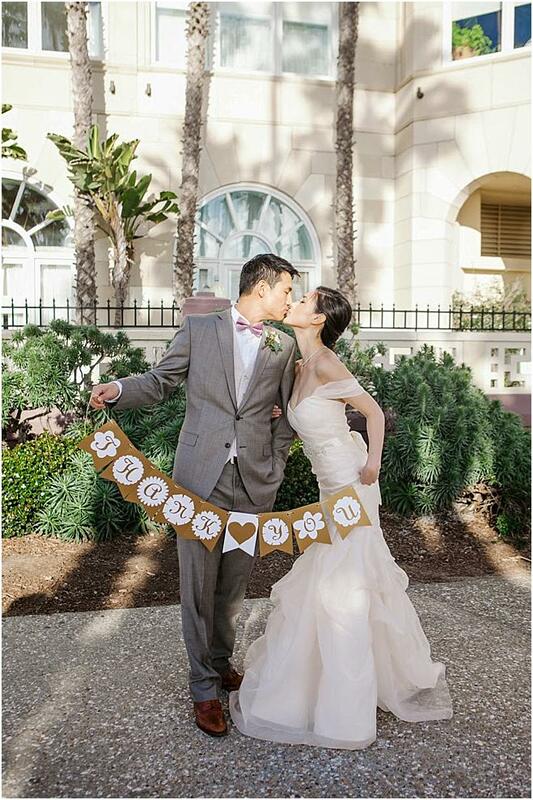 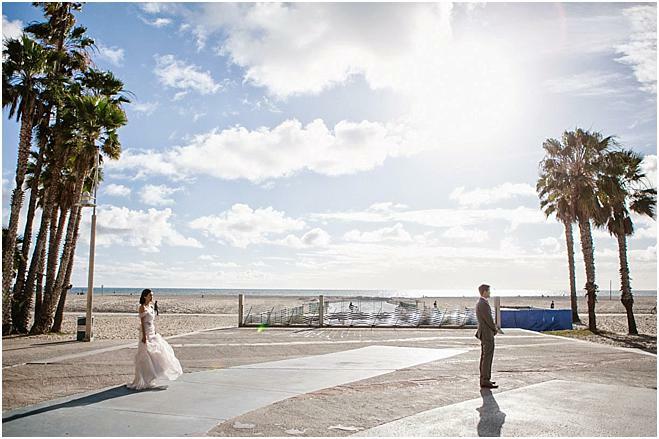 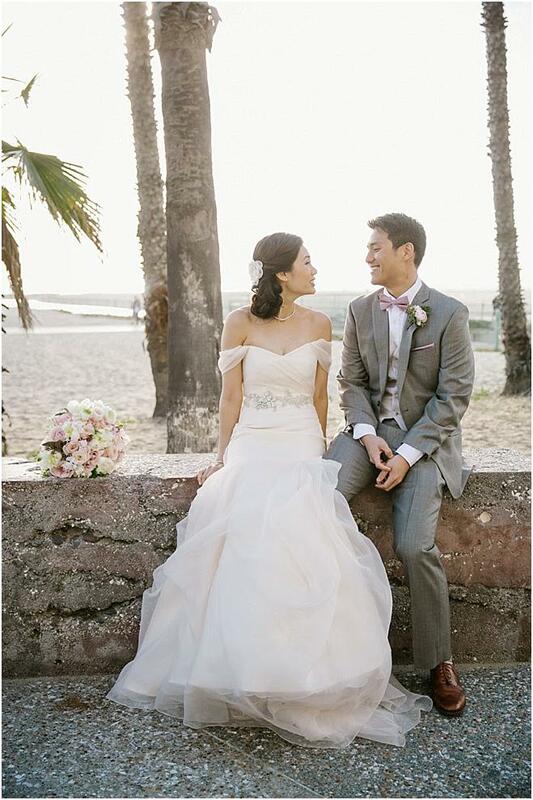 Dimay and Austin's beachside affair at Hotel Casa del Mar was everything a couple could want, with stunning ocean views and the sheer grandeur of the venue. 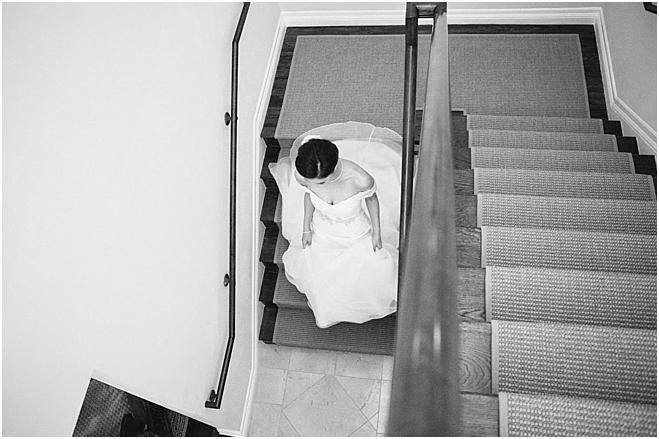 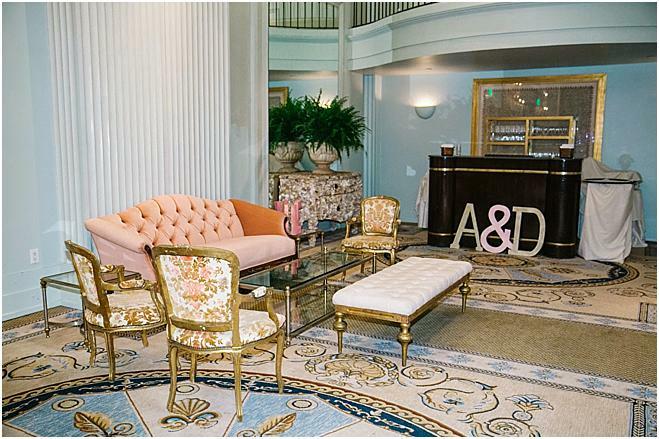 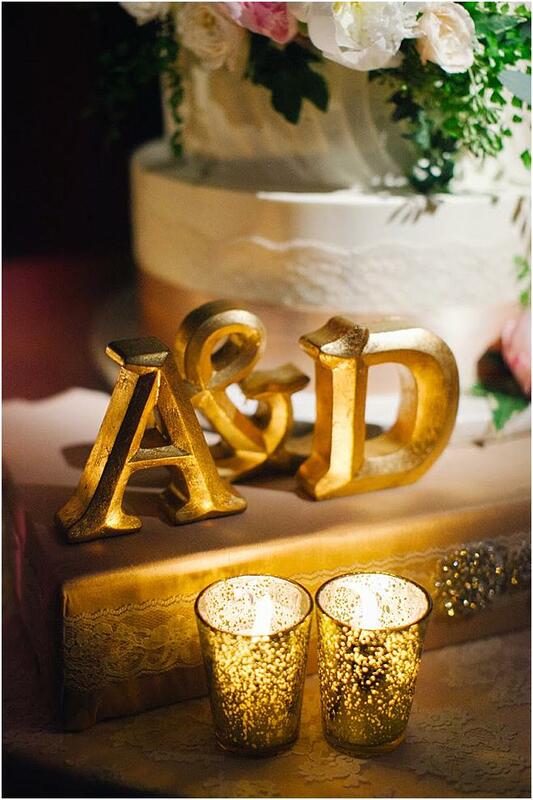 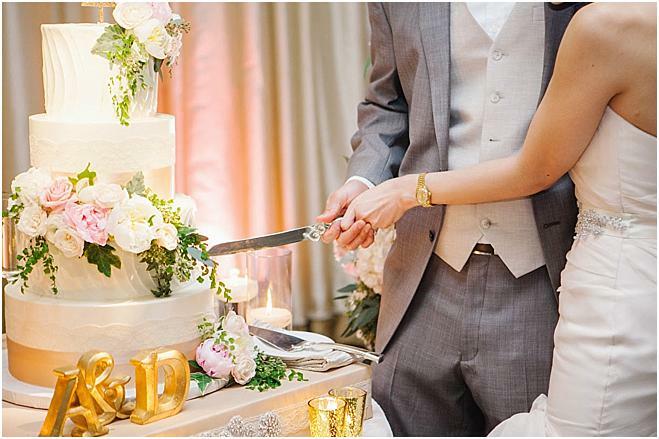 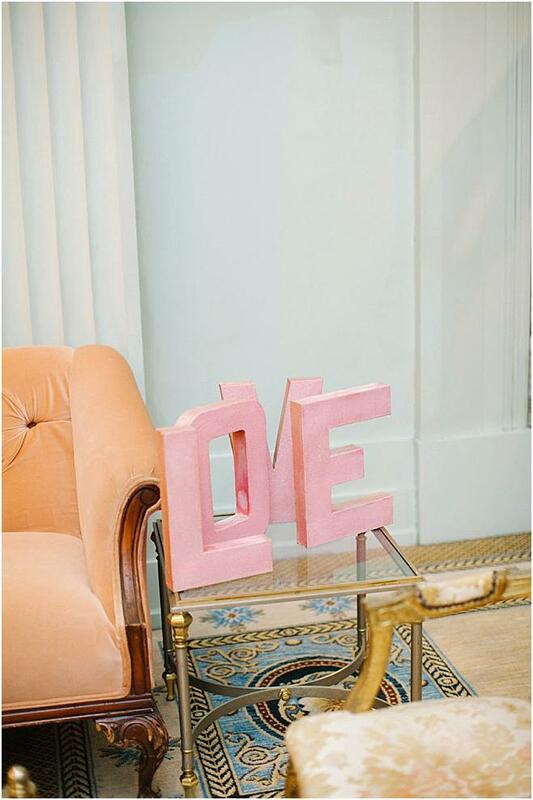 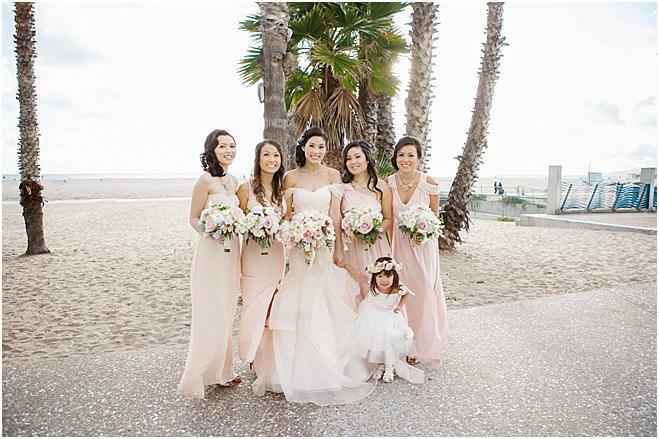 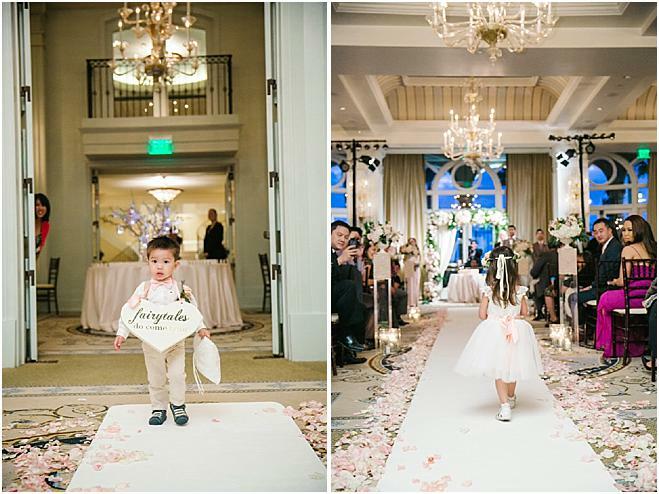 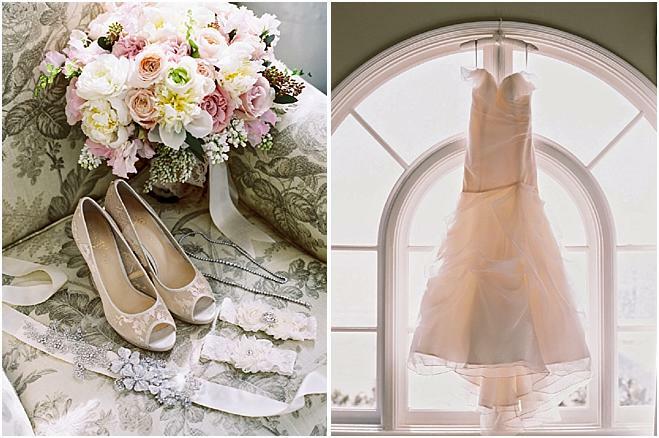 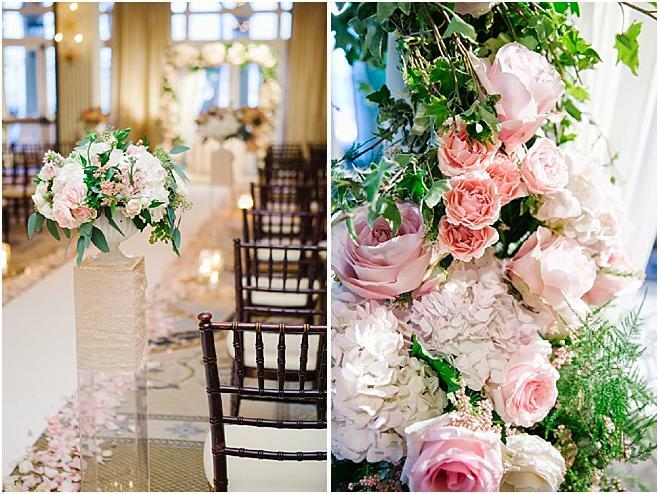 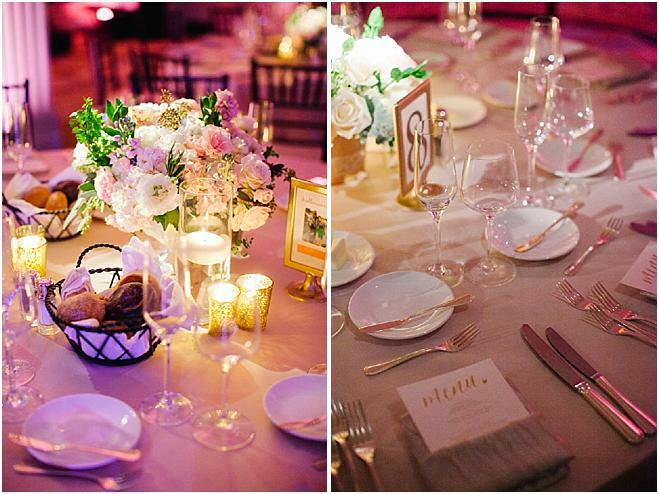 Lovely hues of blushes, creams and touches of gold created a fresh palette perfect for the light and airy venue. 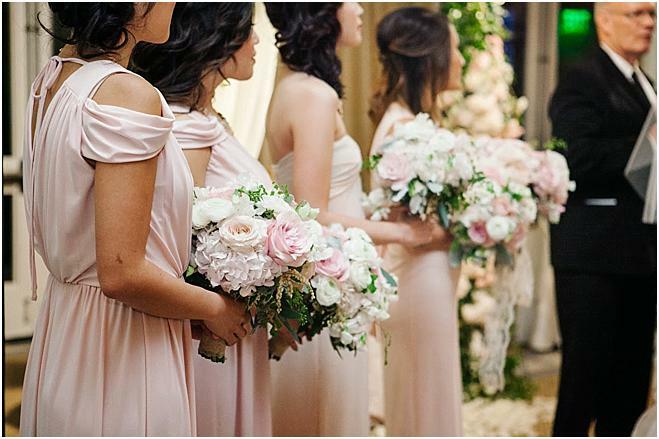 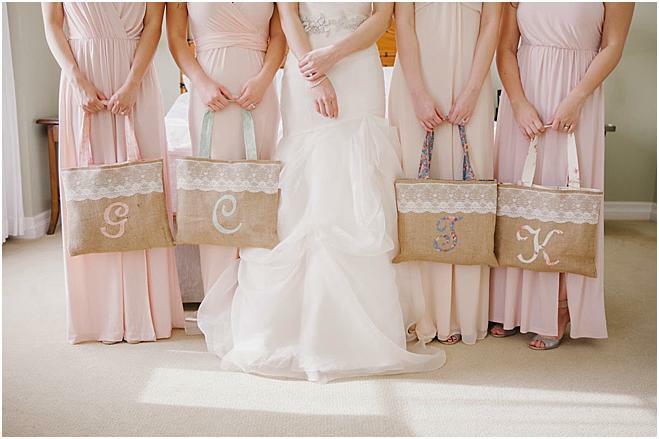 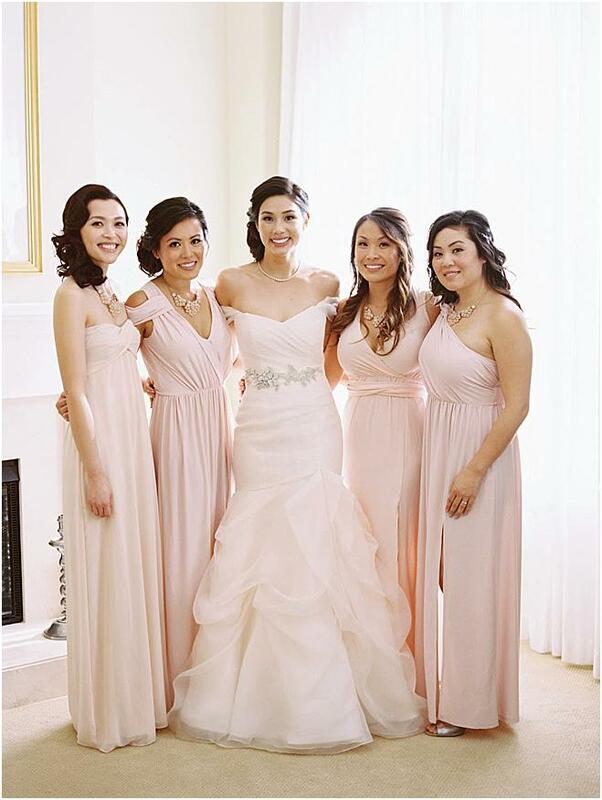 Light pink bridesmaids dresses in various styles perfectly matched the rose gold accents throughout the day, including the gorgeous rings. 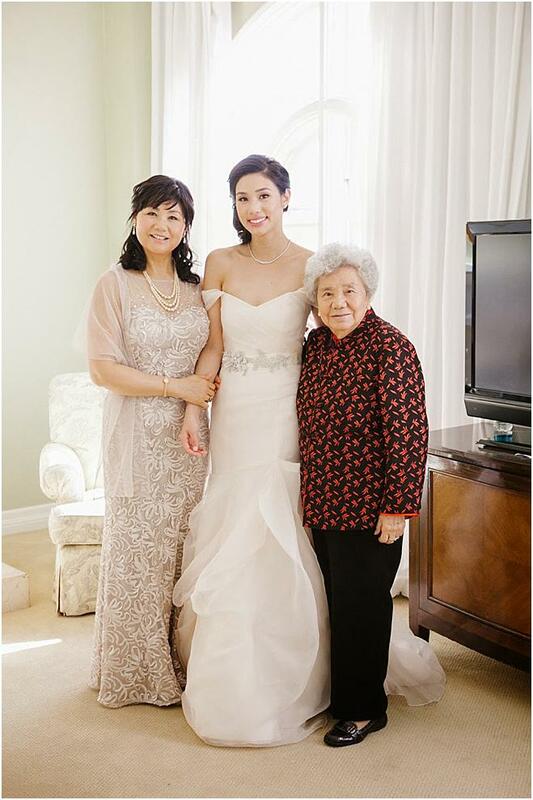 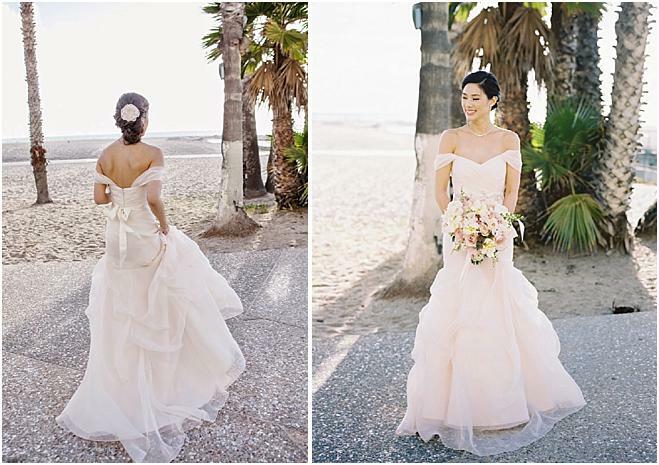 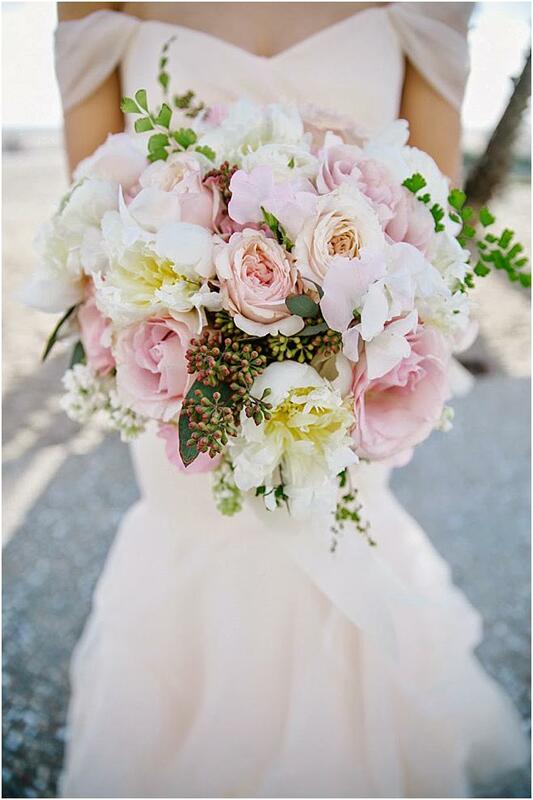 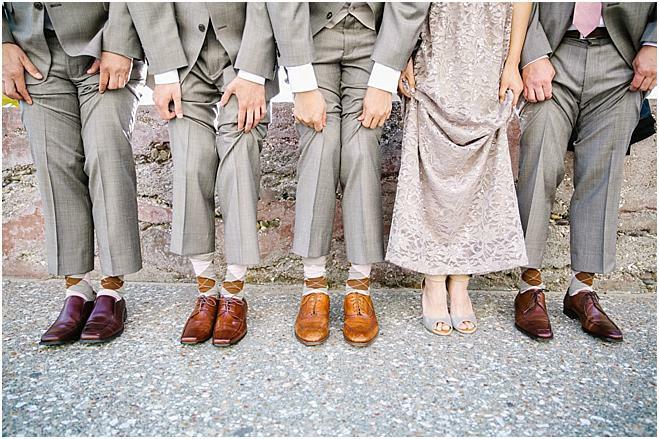 The bride's polished bouquet of blooms beautifully tied together the look. 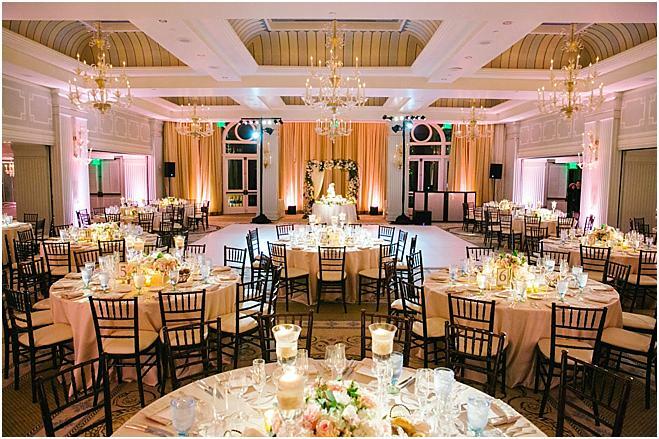 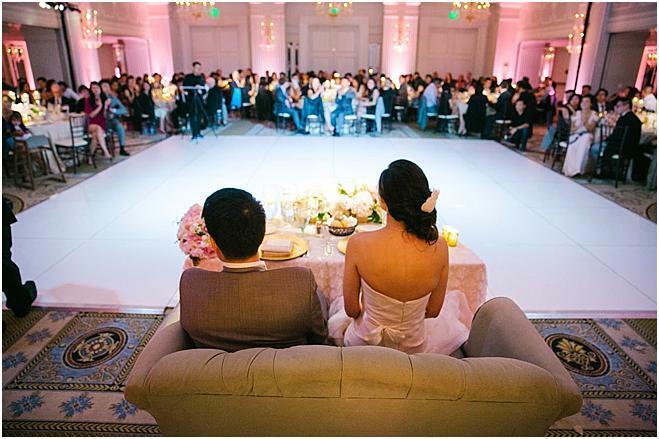 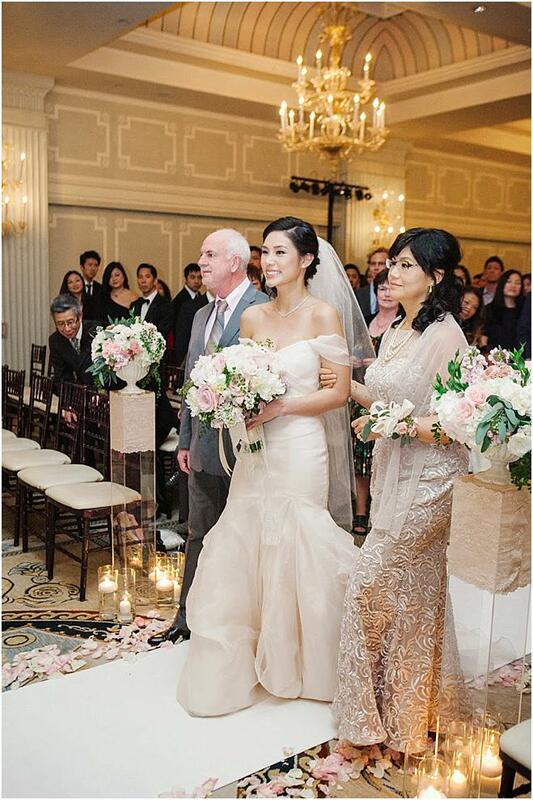 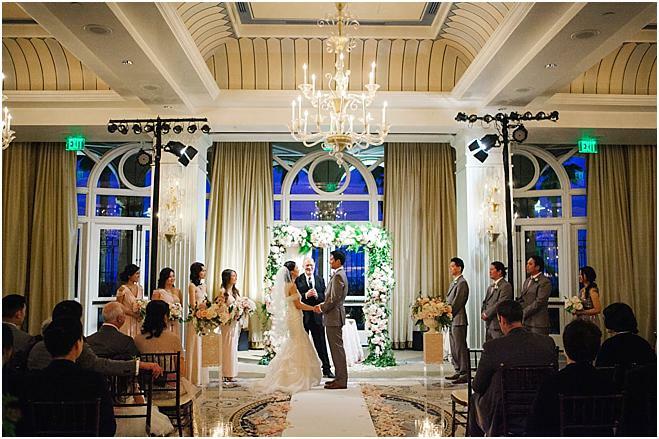 An elegant ballroom ceremony, complete with chandelliers and gold drapes provided the backdrop for the lovely couple to say their vows. 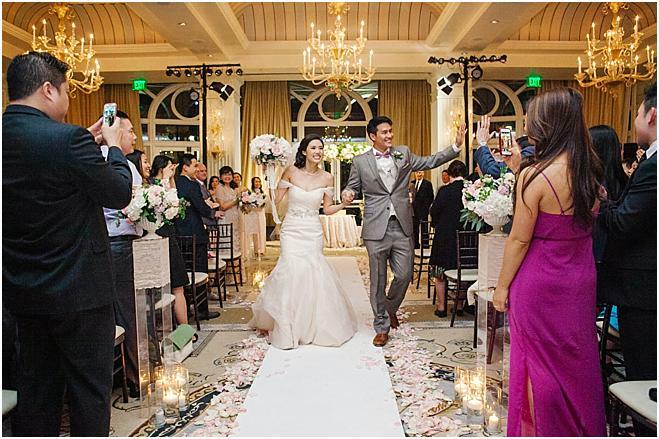 The bride walked down an aisle lined with flower petals and candles, leading to an arbor graced with greenery and cascading florals. 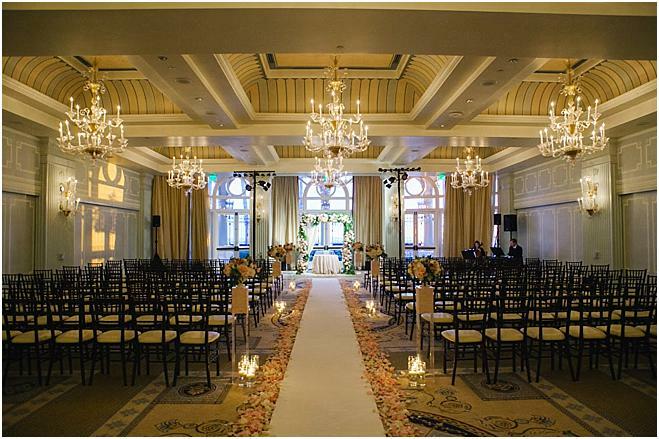 Simple floral arrangements sat atop clear square columns lining the aisle, a seamless continuation of the floral design by LV Floral Events. 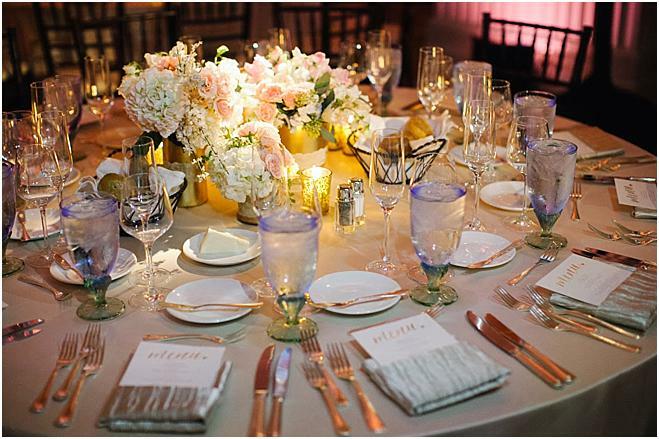 The wedding reception boasted tablescapes featuring elegant glassware and centerpiece coordinating with the ceremonial flowers. 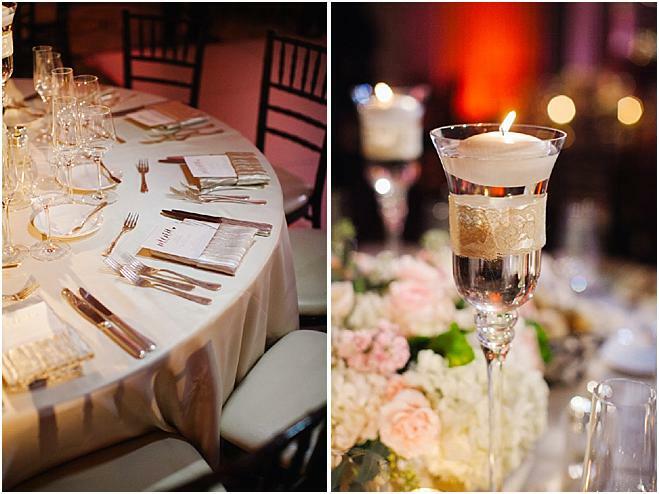 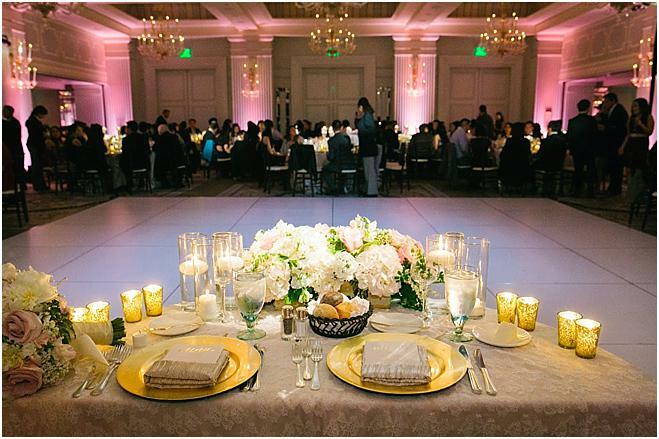 Small glass votives on the tables illuminated the room, providing warmth and an exquisite glow to the affair. 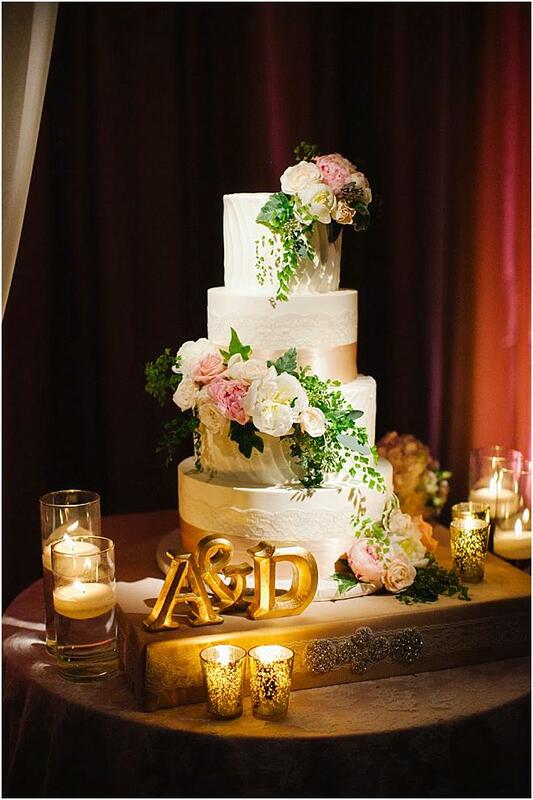 A white four-tiered cake by Vanilla Bake Shop adorned in floral accents mimicked those of the arbor, while the initials of the couple on the cake stand added a sweet personal touch. 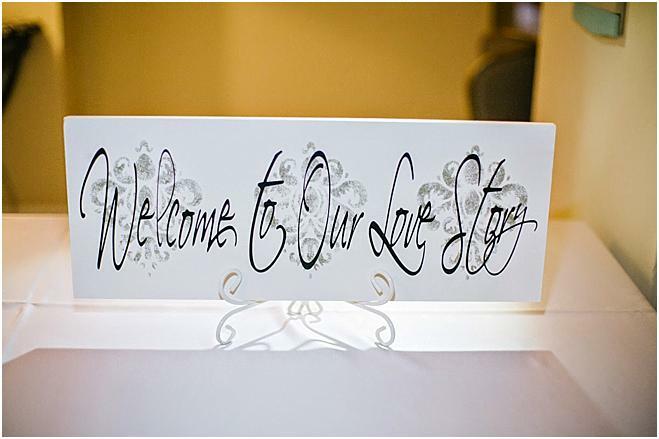 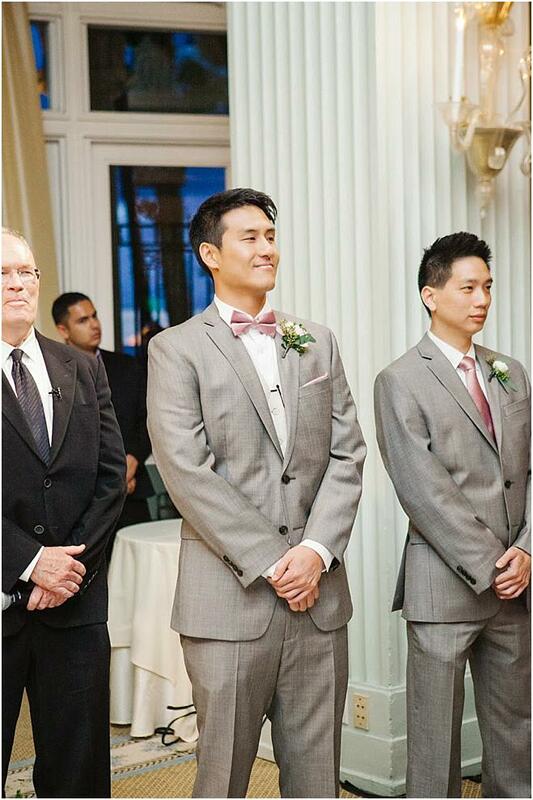 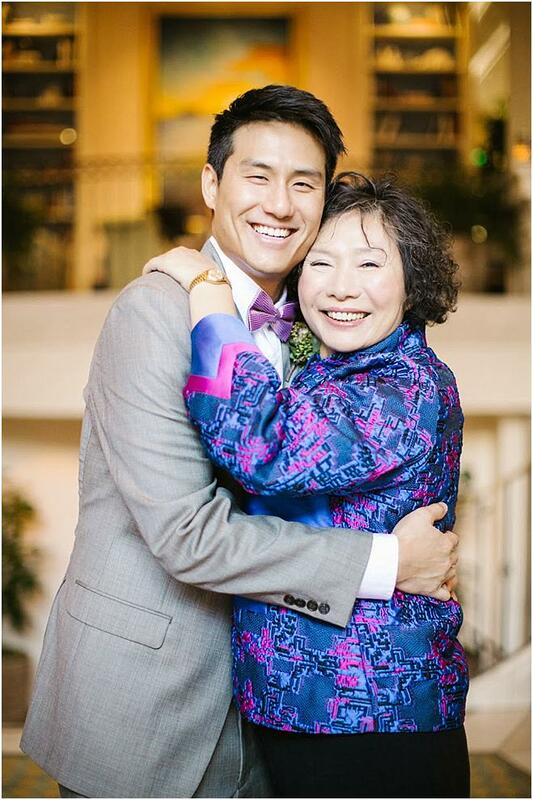 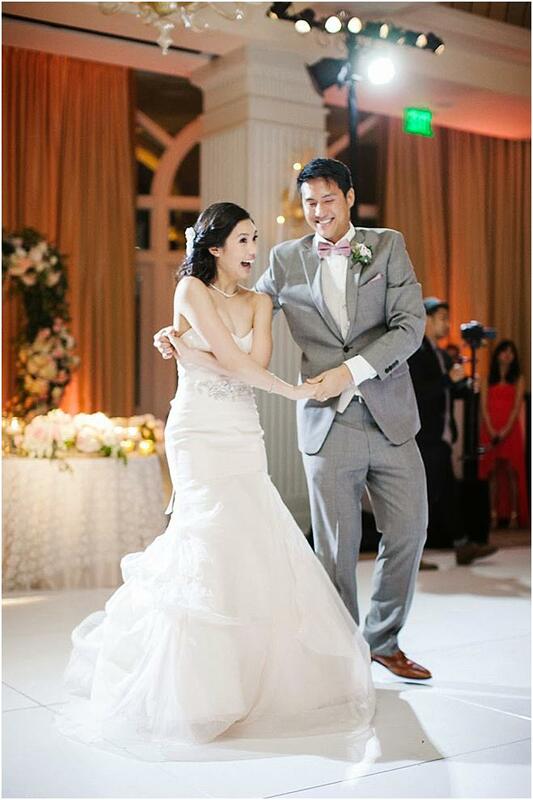 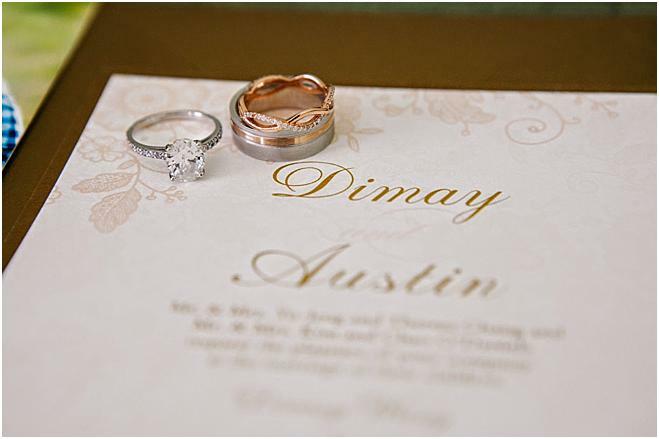 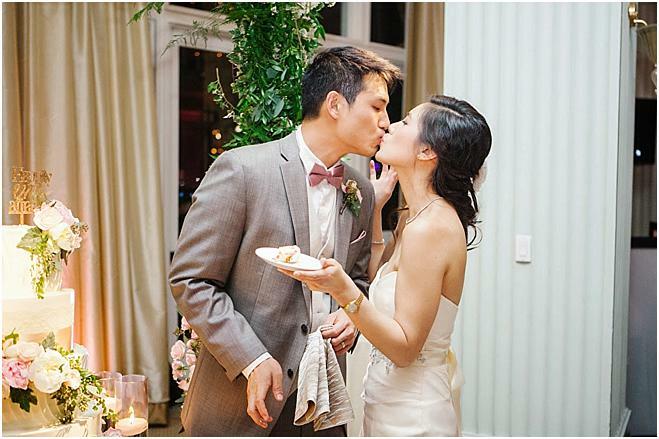 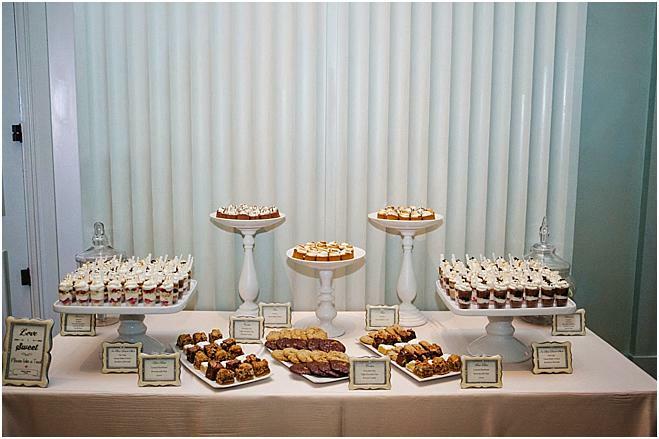 Guests were treated to a plethora of various sweet treats as they celebrated Dimay and Austin's wedding day.